We are not currently accepting commissions. Due to health issues we are taking a break for 6 to 12 months on custom orders. Check back in late summer 2019 to see if this has changed. Sorry to disappoint! We take good care of our custom clients and they are enthusiasic and loyal in return. You can read first hand accounts of that in our testimonials. 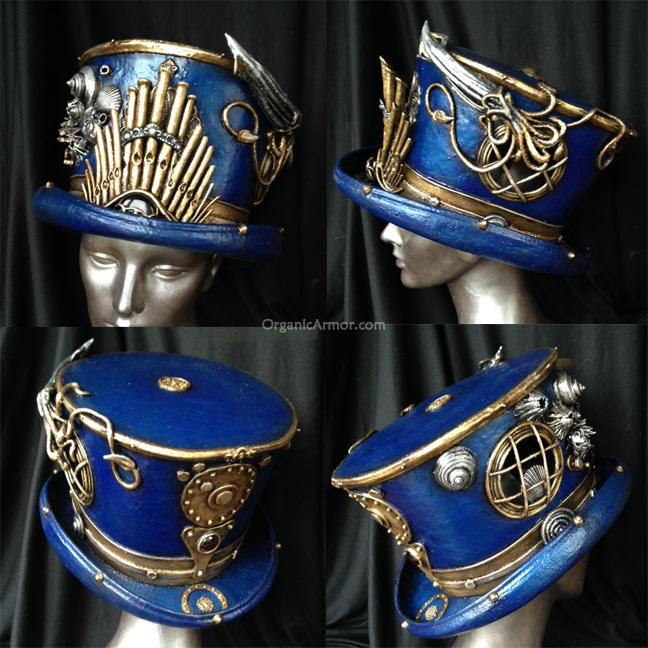 You can see a wide variety of custom pieces in our galleries, from Queen of the Damned crowns to Captain Nemo top hats, Medusa corsets to Wildling helms. If you like something there, contact us to inquire about having a similar piece made just for you. If you have a completely new idea, write us and describe it. Our unique materials are so versatile, almost any form is possible. We start by discussing your ideas. Many people provide reference images, links, or sketches. We give you an estimate in cost and completion time. The completion time estimate is only good for a week. Scheduling changes fast around here. The quoted price is good for 6 months. Once we confirm the details, you place the order by putting down a 25% deposit via Paypal. Then we schedule the work on your project. Your deposit is not refundable. After making the deposit, you can break up the payments in any way that’s convenient as long as it’s paid in full by the time it’s finished. We will ask for measurements and other info. Sometimes we do sketches to clarify the design. We will keep in touch with you on our progress, sometimes sending in-process photos. When the order is complete, we send final photos to you. The balance, plus shipping cost, is due before we ship. We will give you all the shipping, tracking, and customs info and stay in touch until you receive it to make sure you are satisfied with the work. Completion times vary widely, from 2 weeks to 3 months. There will be several other projects already scheduled before we can start yours, so add the length of the waiting list to the completion time. In other words – if a piece is going to take 3 weeks to make and we are scheduling production 12 weeks ahead, your ship date is going to be approximately 15 weeks from the date of deposit. We love getting pictures of happy customers wearing their armor, like this one of Victoria in her Loki set at NYComicCon 2013. We look forward to collaborating with you! Contact us now to start your own commission.